Medical experts believe it's quite safe for children with egg allergies to get the MMR vaccine, evenif their allergy is severe. Since this question first was raised more than two decades ago, several studies have documented the safety of the MMR vaccine in children who are allergic to eggs. You certainly should discuss any concerns you have about the recommended vaccine schedule with your child's pediatrician, but there's no real cause for concern—and some very real reasons to make sure your child gets the shot. The MMR vaccine protects children and adults against three diseases: measles, mumps and rubella. The Centers for Disease Control & Prevention calls for children to receive two MMR shots: the first when they are 15 months old, and the second booster shot when they are four to six years old. The concern about egg allergy arose because two of the active ingredients in the MMR vaccine—the measles and mumps components—are grown in cultures from chicken embryos. Chicken embryos obviously start out as eggs. Still, even though the MMR vaccine is cultured in a way that could lead to egg protein in the vaccine itself, the amount of egg protein in the vaccine that's actually given is extremely low, and it's not enough to spark an allergic reaction, even in someone who is severely allergic to eggs. There have been several studies that have shown the vaccine to be safe, even for children who have a history of severe allergic reactions to egg. For example, doctors in Spain gave the MMR shot to 26 toddlers with egg allergy. None of those children had an allergic reaction. And in Denmark, doctors immunized and tracked 32 egg-allergic toddlers, none of whom had an allergic reaction to the vaccine (some of the vaccines in Denmark were given following what the authors called "considerable delay" from the recommended vaccine schedule). In both cases, the clinicians involved reported that the vaccine is safe in children with an allergy to eggs. Based on the medical research that's been done, both the Advisory Committee on Immunization Practices (AICP) and the American Academy of Pediatrics (AAP) recommend the MMR vaccine for children with egg allergies. In addition, the National Institute of Allergy and Infectious Diseases guidelines call for children with egg allergies to get the MMR vaccine. These guidelines were written by a panel of experts from 34 professional organizations, federal agencies, and patient advocacy groups, including prominent allergists who specialize in food allergies. The MMR vaccine is safe, even if your child is allergic to eggs. 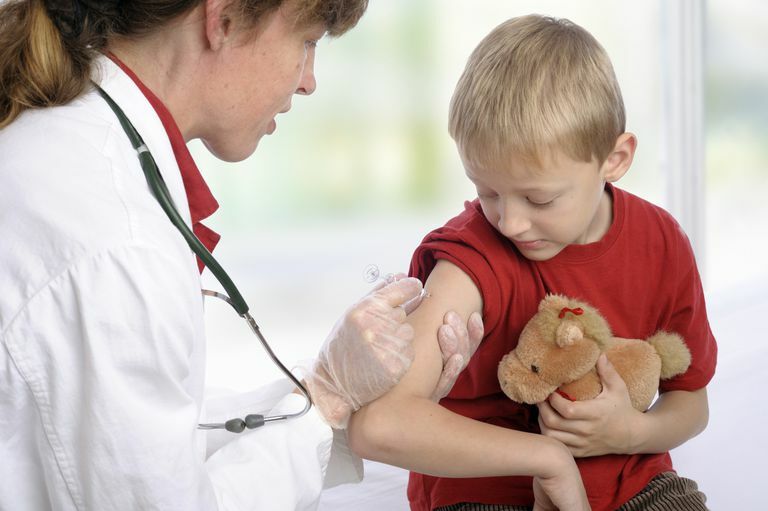 In addition, sometimes, the MMR vaccine is administered bundled with the varicella (chicken pox) vaccine—at which point it is referred to as the MMRV vaccine. The varicella vaccine does not contain any egg protein, so the combined shot is also safe for children with egg allergies. Note that there are some children (and adults) who should not receive the MMR vaccine. According to the Centers for Disease Control and Prevention, this list includes: anyone who has had a life-threatening reaction to the antibiotic neomycin; anyone who has had a life-threatening reaction to a previous MMR shot; and pregnant women. If your child is sick at the scheduled time to get the MMR shot, your doctor may advise waiting until your child is better. If you have any concerns at all about the MMR vaccine (or any of the other vaccines recommended for babies, toddlers, and children), talk to your child's pediatrician. Andersen DV et al. MMR vaccination of children with egg allergy is safe. Danish Medical Journal. 2013 Feb;60(2):A4573. Cerecedo Carballo I et al. Safety of measles-mumps-rubella vaccine (MMR) in patients allergic to eggs. Allergologia et Immunopathologia (Madrid). 2007 May-Jun;35(3):105-9. James JM et al. Safe administration of the measles vaccine to children allergic to eggs. New England Journal of Medicine. 1995 May 11;332(19):1262-6. NIAID-Sponsored Expert Panel. Guidelines for the Diagnosis and Management of Food Allergy in the United States: Report of the NIAID-Sponsored Expert Panel. The Journal of Allergy and Clinical Immunology. Volume 126, Issue 6, December 2010.